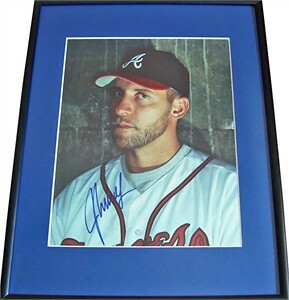 Full page magazine photo autographed in blue marker by Atlanta Braves future Hall of Fame pitcher John Smoltz, matted in blue and framed in black, ready to hang. ONLY ONE AVAILABLE FOR SALE. With certificate of authenticity from AutographsForSale.com.